Cherry Cola is a winner! Cherry Cola has tested good! Testers reported back that it smells wonderful, so it turns out it was my candle maker nose after all. so this is the batch I decided not to send in for the swap. it came out really pretty and smells great. But when I used it in the shower it smelled different to me. I am unsure if it is my candle maker nose(can't smell things correctly) or not. 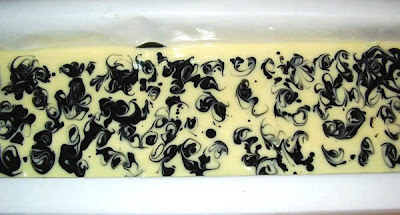 I have given a few bars to some testers to make sure it smells good before I decide to put it up for sale. So stay tuned for the testers results. I am doing a swap with a number of other candle/soap makers and we are trying not to show exactly what we are making. 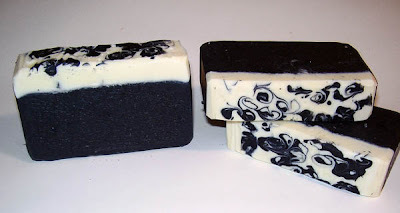 I have made 2 batches of soap, 1 of which will be for the swap. I am still deciding which to use then I will post pictures of the other batch. The one going for the swap will be posted in september. Now I am trying to figure out what scent to make next. I have been wanting to make a Vanilla bar with sand from Point Dume(said like Doom) in Malibu for a long time. For those of you who don't know I love to go surfing(learned how last summer) well I can tell you after a few hours of getting tossed around in the ocean with the sand my skin feels wonderful. The sand from point dume is like no other around here it is so soft and nice compared to other beaches. So maybe I will finally make that bar?!?!?!?! ?